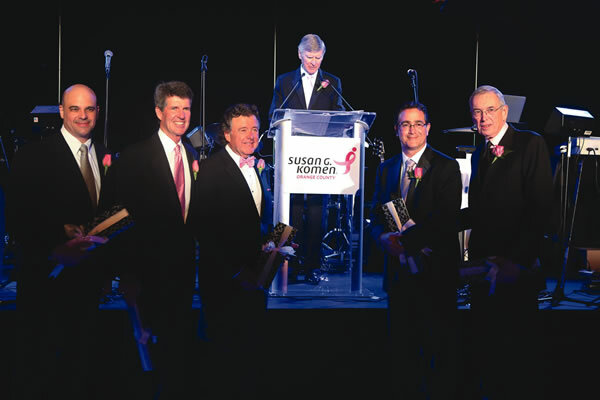 Supporters of the Susan G. Komen Orange County mission of ending breast cancer raised funds at Lake Mission Viejo May 11 at the nonprofit’s seventh annual Pink Tie Ball. Supporters of the Susan G. Komen Orange County mission of ending breast cancer raised funds at Lake Mission Viejo May 11 at the nonprofit’s seventh annual Pink Tie Ball. The event began with a silent auction and “Stars of Hope” opportunity drawing, followed by dinner, an inspiring presentation from event chair and breast cancer survivor Estela Riela and the introduction of the 2013-2014 class of Pink Tie Guys, influential men who advocate for breast health in the OC community. The seven additions join 49 other Pink Tie Guys selected in the past, because, “Once a Pink Tie Guy, always a Pink Tie Guy,” news anchor and Pink Tie Guy Ed Arnold said at the event. The spirited live auction featured prizes such as a Beyoncé concert VIP package and a Santa Barbara getaway. Chevron matched a $25,000 donation putting the amount raised at more than $385,000. Seventy-five percent of money raised will go toward breast health community programs, with the other 25 percent going toward funding breast cancer research. —L.D.